While the novel is not specifically about the data storage industry, (it is about an elite group of con artists calling themselves the “Gentleman Bastards” who engage in elaborate trickery to rob the citizens of an imaginary land), it can be said that life imitates art. For many people who work in the data storage industry, the sky is indeed falling. First, the once-mighty EMC collapsed into the arms of Dell, prompting an exodus in which much of the sales and marketing talent relocated noisily to young companies like Pure Storage and Nimble, while much of the engineering talent quietly rejoined their old boss, Moshe Yanai, here at INFINIDAT. All the while, previous number two dog, IBM, watched their storage revenue decline by 40% in six years with no sign of turnaround in sight. More recently, investors are tightening the noose and losing patience with companies like Pure Storage that continue to expand their salesforce while being unable to turn a profit and issuing worrisome 2018 guidance. We here at INFINIDAT have a simple theory as to why the sky is falling for so many other storage companies – their products don’t do what they say on the packaging – and no amount of clever marketing can fix this. Along with the usual messaging about TCO and manageability, the fundamental promise of all-flash array vendors was superior application performance. Disk: bad, old, slow. Flash: good, new, fast. Their problem (which is now becoming their customers’ and investors’ problem) is that their products are not really that fast. Maybe the test was flawed, maybe the Pure systems were not tuned properly or were in garbage collection mode (which INFINIDAT systems don’t have, by the way). We don’t know, but that’s not the point. When that article appeared in The Register and circulated among INFINIDAT developers, we couldn’t believe how terrible BOTH of the results were, and that EMC was proud enough of the Unity numbers to publish them, and use them to attack another vendor no less! 4.4ms latency is no less of a joke than 13.6ms when your raison d’être is high performance. So last week we finally got around to running the same profiles against an INFINIDAT F6230 in our Waltham Solution Center, configured with 1.1TB of DDR-4 DRAM, 200TB TLC NAND, and 480 3TB nearline HDDs. By the way, we took the liberty of running the test with a 200TB data set instead of Pure and EMC’s 50TB because modern workloads require performance at scale, and we ran it with in-line compression enabled because our compression algorithm doesn’t hurt performance. This was an interesting test to run, and we hope it helps the storage industry move away from media type wars and benchmarks (you will lose every time on performance if INFINIDAT is in the mix). At INFINIDAT, we believe the conversation needs to shift toward more interesting topics that customers truly care about like quality of APIs (Yes, not all REST APIs are created equal), reliability, customer satisfaction, and total cost of ownership. 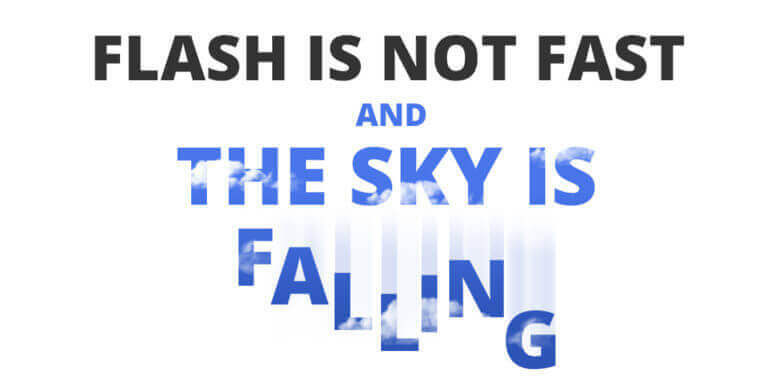 It shouldn’t be the case that the sky is falling for so many data storage companies. IDC predicted last week that humanity’s data footprint will increase 10x between now and 2025 and 60% of that data will be generated by businesses. There is no shortage of demand. However, customers are increasingly scrutinizing the strategies of their storage vendors and learning to differentiate between fake innovation and the real thing. Building undifferentiated systems and engaging in a sales and marketing arms race to buy market share from one another using investors’ money is fake innovation that destroys value. Incremental enhancements (like all-NVMe retrofits) that provide superficial justification for out-of-touch pricing is fake innovation that harms customers. We have one job: never stop delivering better value. That means harnessing our collective innovation to make storage radically less expensive, not more. Make it more reliable – INFINIDAT is 7-nines – who will be the first to get to 8-nines? Make it easier to manage by improving APIs and scalability – customers want massive, horizontal pools of storage in their data centers to absorb IDC’s growth predictions, not sprawling estates of small systems. Information storage is an exceptionally difficult software engineering problem, but the benefit of real innovation to customers (and humanity as a whole) makes the job worthwhile.